We know we like literally just talked about Shannon & The Clams a little bit, but we figured bebe girl deserved more than just a mention. Their second full length, Sleep Talk, is coming out right on 1-2-3-4-Go! Records in the next week or so and it rules. 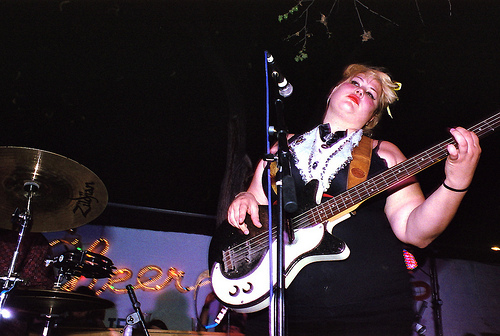 We got to catch Shannon at SXSW this year for the first time and they were definitely one of the best bands we caught. The power went out, the bass amp sucked, the guy running the sound board was a dummy… all the problems in the world, and they still killed it. They’ll be in town on Saturday with Hunx, so be sure to hit it. They may also have copies of King Lollipop’s debut cassette. It’s being reissued on vinyl a little later this summer by 1-2-3-4-Go! and it sounds pretty sweet. Doo it!